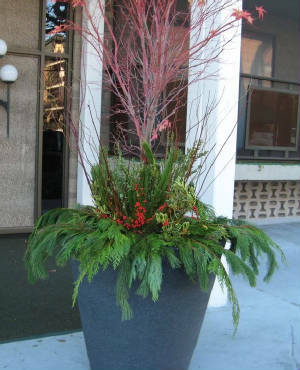 If your looking to add a splash of color to brighten your yard and add a welcoming feel to your enterance way creating a holiday planter is just what you need! Using winter green cuttings the planters are designed and installed on site to make a unique and personal touch. The greens are just the added color your home or office is missing in the winter. After being installed (November/December) they stay looking beautiful through the winter.